This originally appeared on The Chimerist. 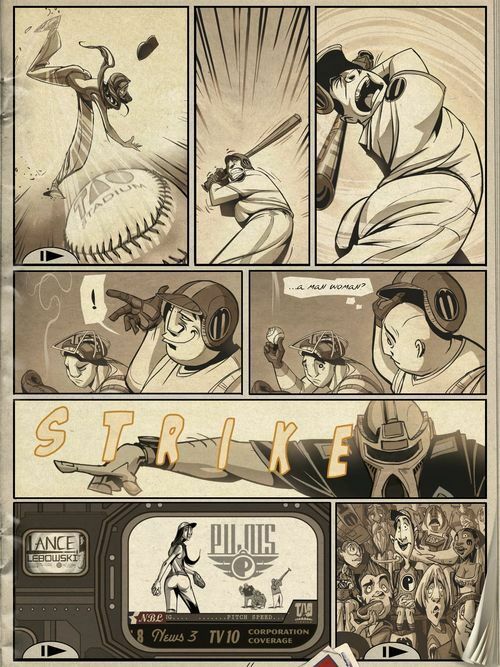 Possibly the most impressive thing to be said about Ryan Woodward’s comic/app “Bottom of the Ninth” is that it got me to read about baseball, a subject I usually exempt myself from due to extreme indifference. 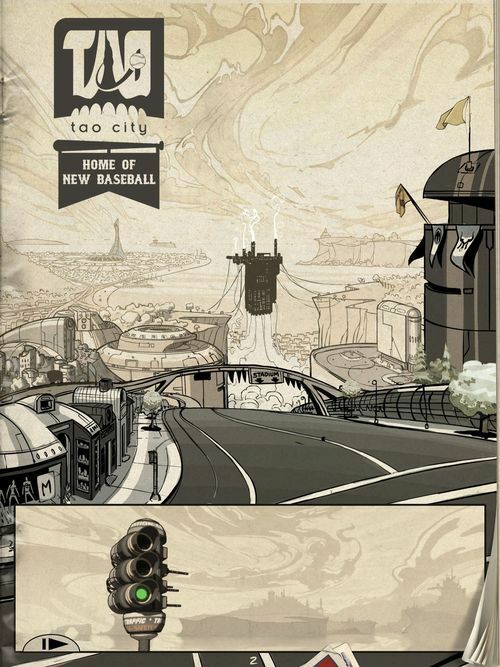 True, the story is set in a slightly sf future (the characters play, or follow, a game called New Baseball) and the central figure is a pitcher who’s the first young woman to play in a professional league, two elements that somewhat softened my resistance to it. But still: baseball, and the way some writers go absolutely sappy over it? Not for me. Then I fell into “The Bottom of the Ninth,” which despite subjecting me to not-great music and a parody version of sports radio, is a lovely piece of work. The art is a very palely-tinted sepia, and the lay out is much like that of traditional graphic novels, albeit a particularly well-drawn one. Select panels feature animations, which are sometimes full-blown action scenes and at other times just the subtlest of details: fluttering pennants, a curl of smoke, a flicker of hair. Some of these barely register, but, along with the excellent sound effects, they create a pervasive sense of place, which, given that the setting is a crazily high-tech sports arena festooned with holograms and jetpack transports, is remarkable. The story (of which the currently available “Bottom of the Ninth” is just the opening installment) relates the experiences of Candy Cunningham, whose first time up on the mound is greeted with scorn and skepticism by the fans. Of course, she wows them, but this only attracts the sinister attention of The Corporation, a monolithic entity that has previously been unaware of Candy. You’d think that the public would have noticed her when she made the team, but I will not presume to quibble on points of sports culture. Tapping on the app’s speech balloons delivers audio versions of the dialog — particularly welcome given that the lettering can be hard to read — and the voice acting is uniformly excellent. An opening sequences dwells overlong on a pair of hamburger-munching, goofball fans as they race to the stadium to catch the game — there’s a particularly nifty animation in which their car zips across several panels, providing a literally moving illustration of how the form should be read. But I for one would be really happy never to see either of those guys again. I suppose the pair is meant to be relatable and humorous, but instead, they’re exemplary of a nagging problem with too many comics, animated or otherwise: sophisticated images married to callow, hamfisted stories and characters. The truth is, sometimes you’re willing to put up with mediocre narrative content to look at something as visually ingenious and elegant as “Bottom of the Ninth.” It would just be so much better if the words and ideas were at a level comparable to what meets the eye! Woodward’s app could well take Candy’s story into more intriguing territory, however, and The Corporation could wind up being more than just an action-movie baddie. It will always be about baseball, however, and even so, I’ll still be reading it.